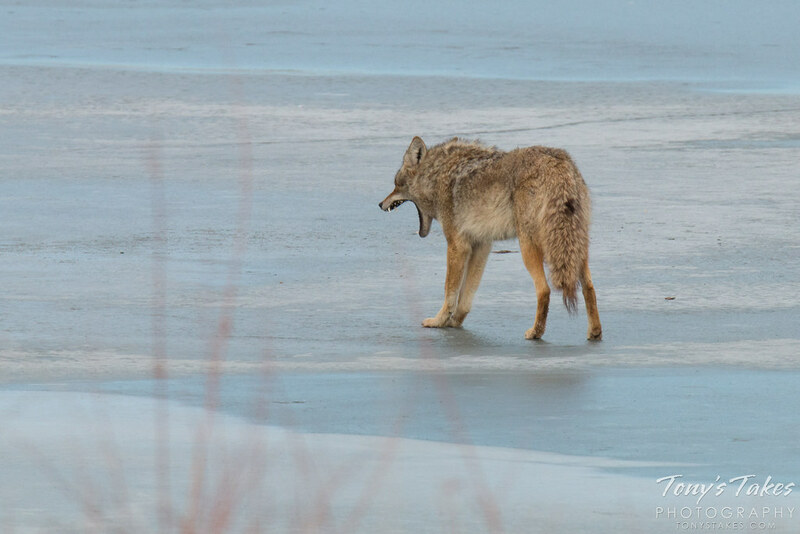 With snow falling here in Denver, I dug through the archives for a picture that somewhat reflects the current weather conditions. 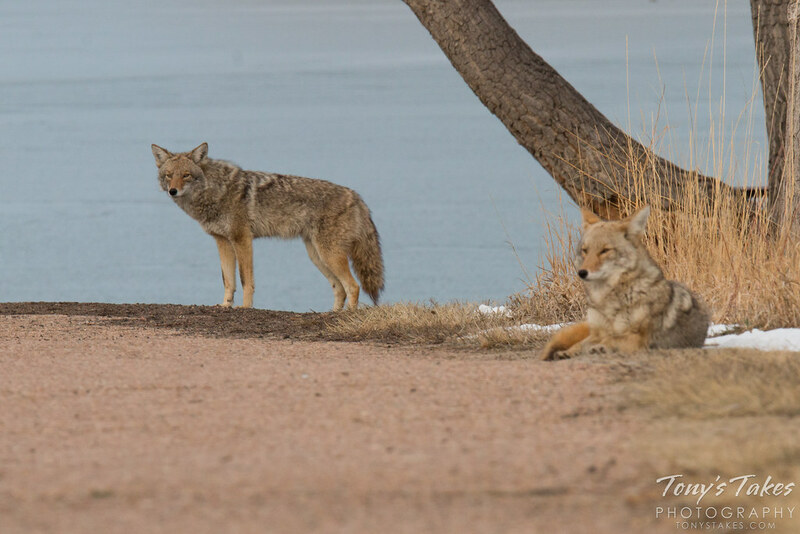 This image was taken in December 2014 at Cherry Creek State Park, Colorado following an overnight snow. 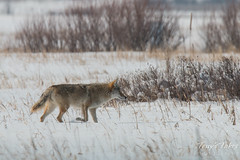 The landscape was resplendent in a blanket of white and the wildlife was out and about and active. 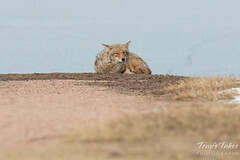 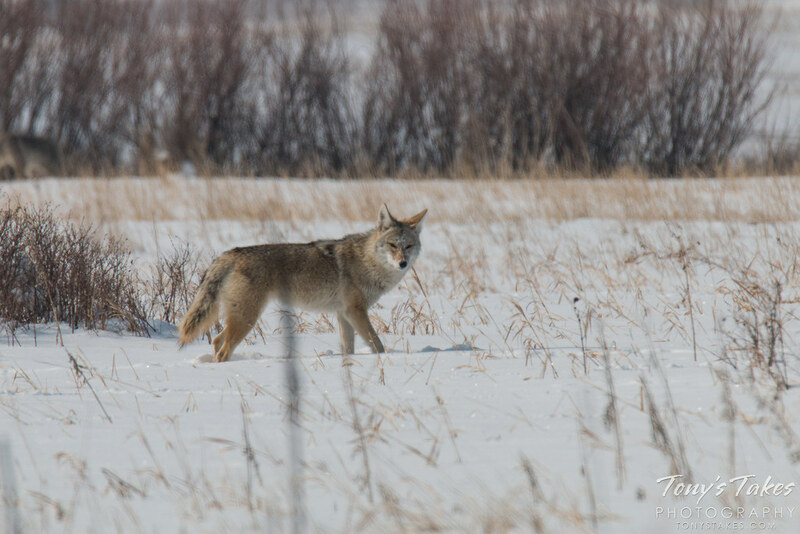 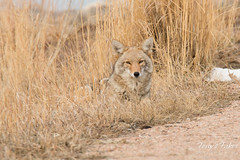 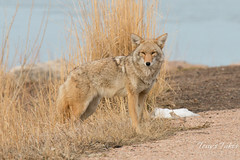 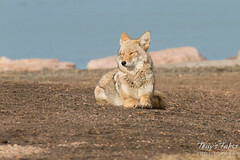 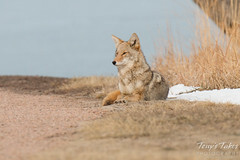 This handsome coyote was resting among some tall prairie grass where it was quite well hidden. 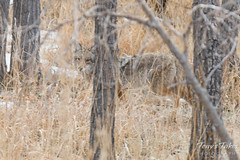 I almost missed seeing it but thankfully I did and better yet it stayed long enough for me to capture some good images of it. 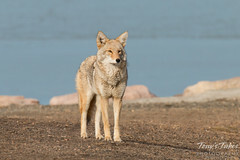 I love the soft, early morning light on its coat and in its eye. 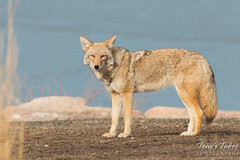 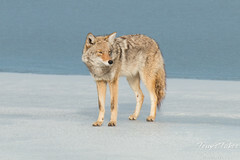 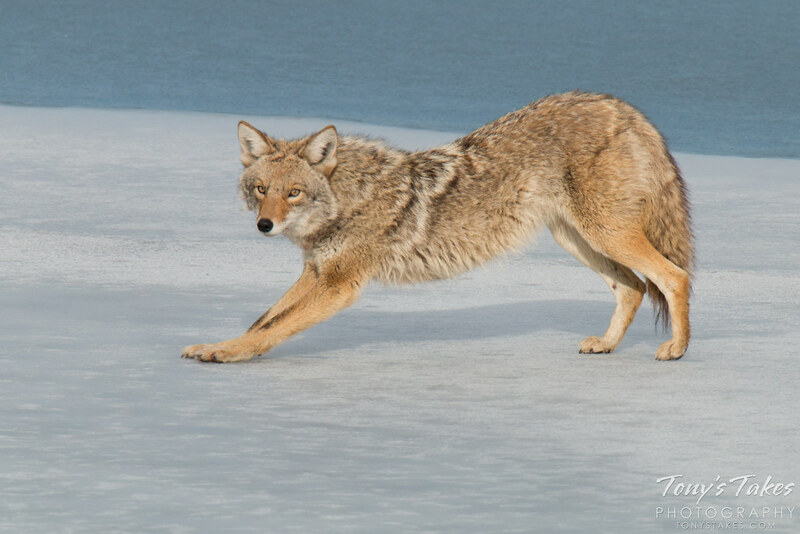 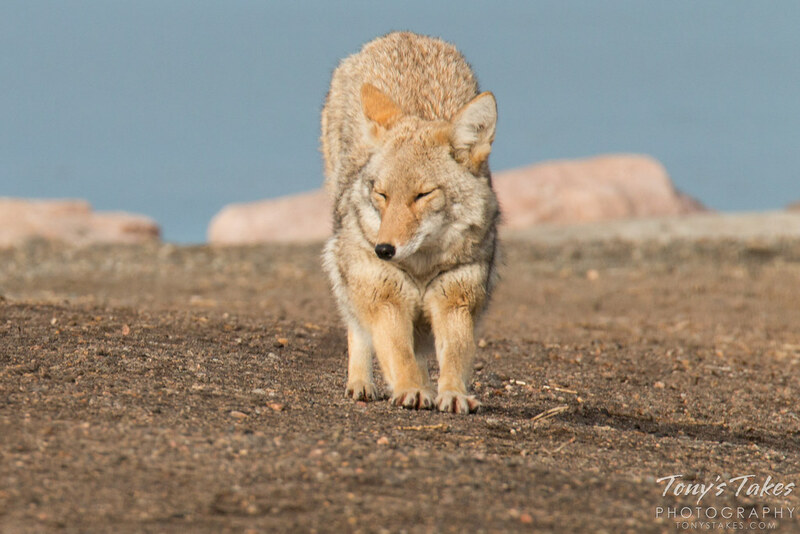 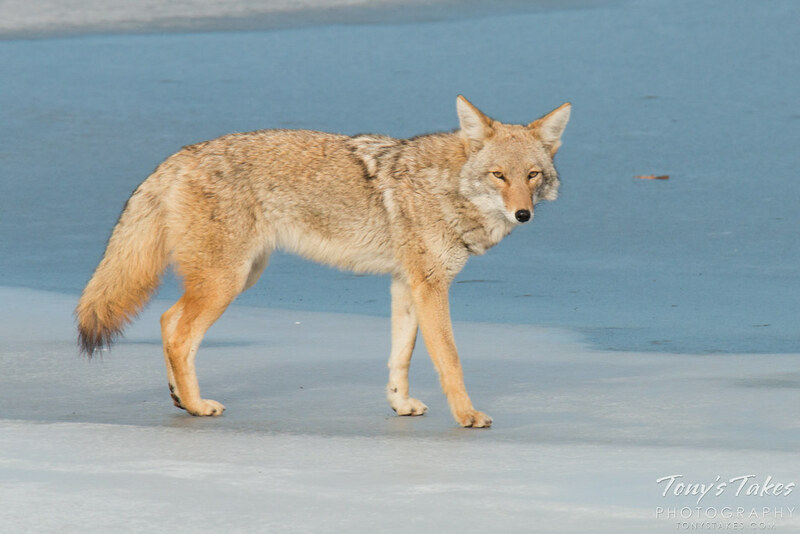 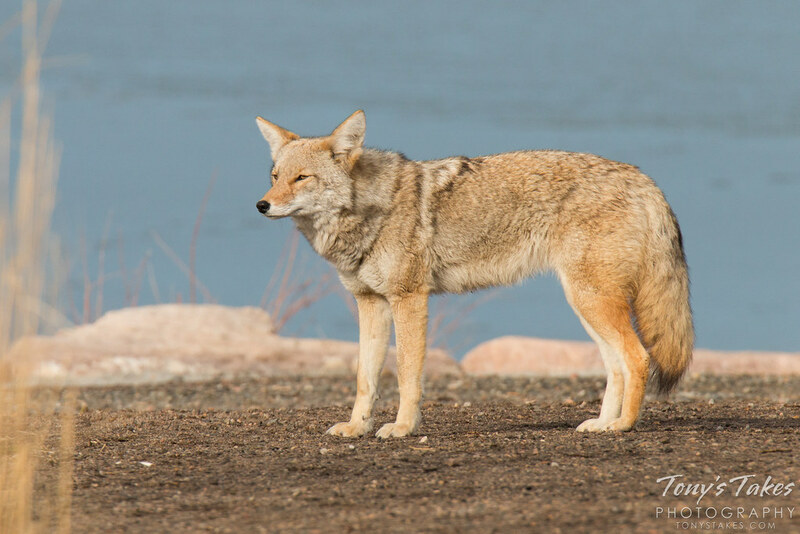 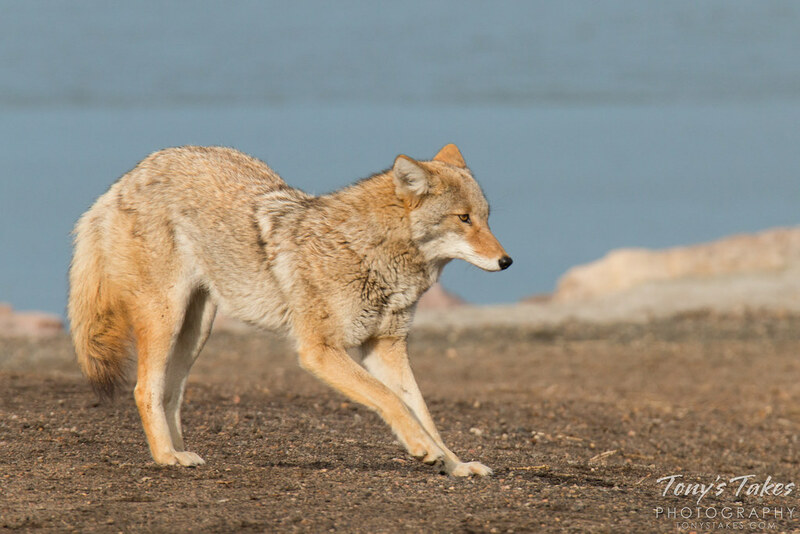 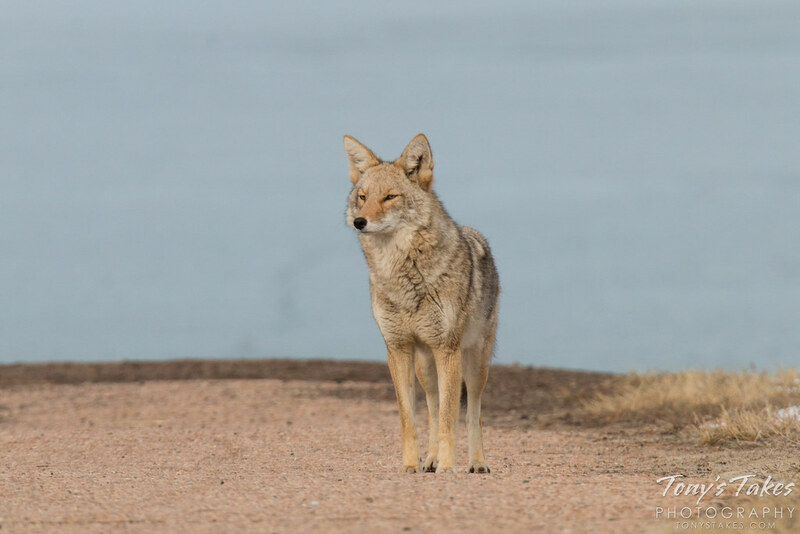 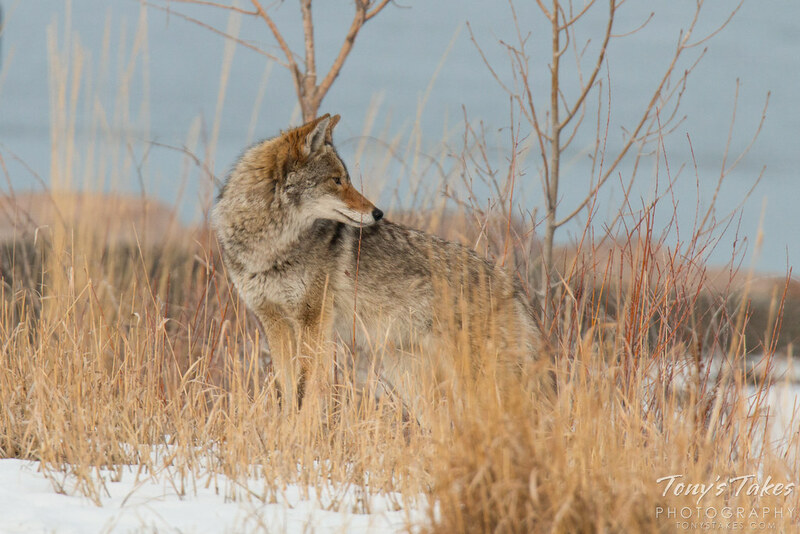 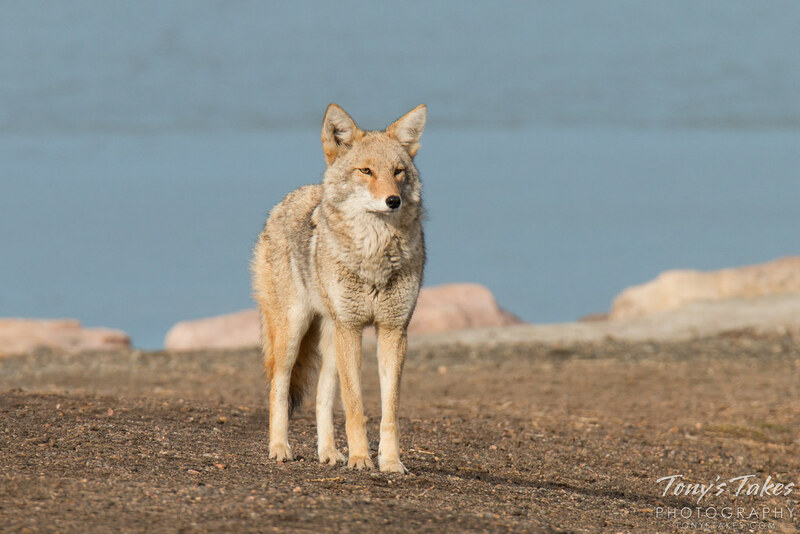 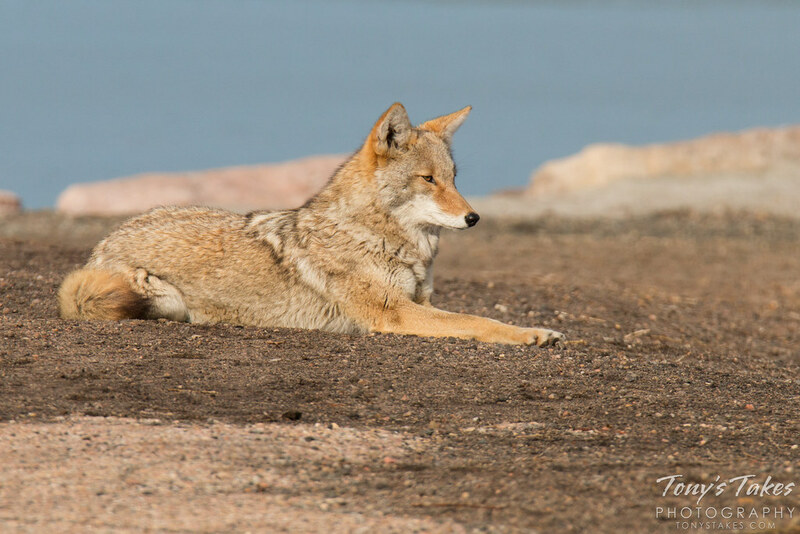 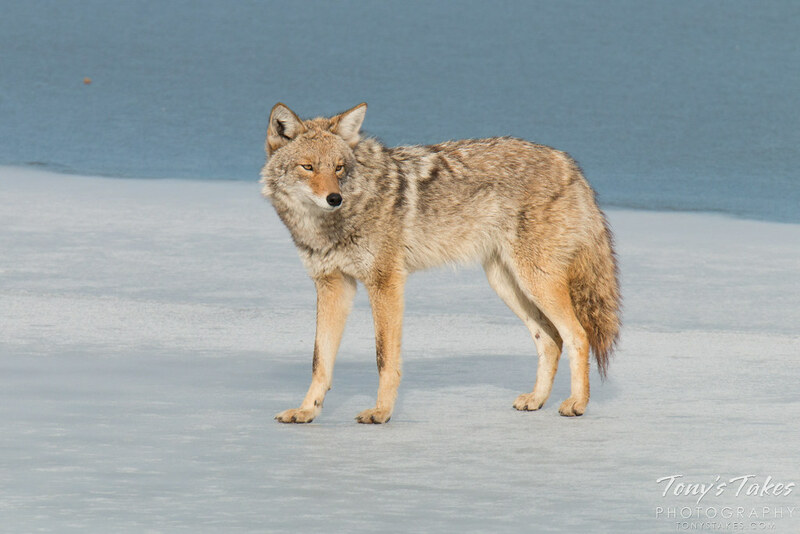 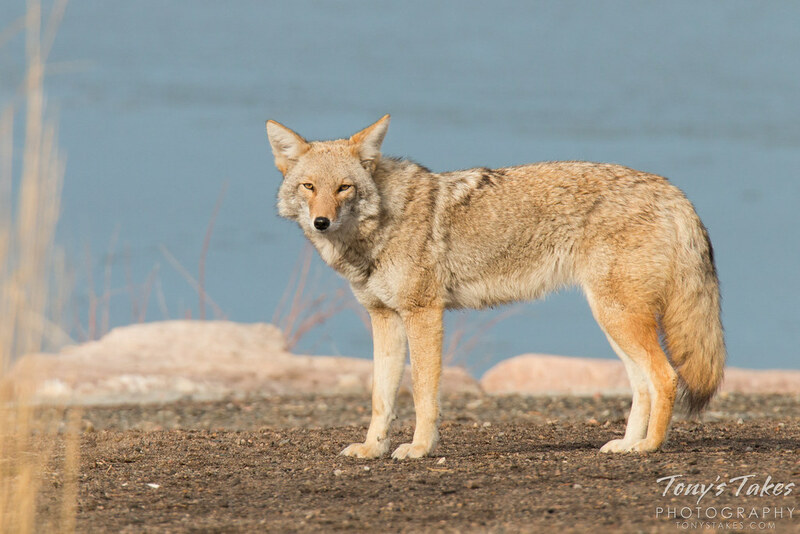 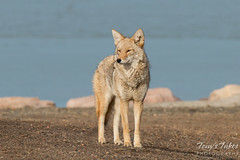 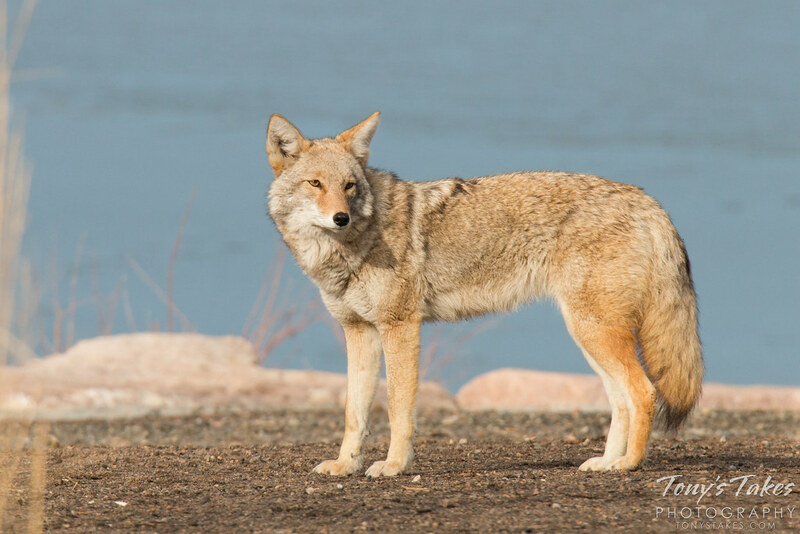 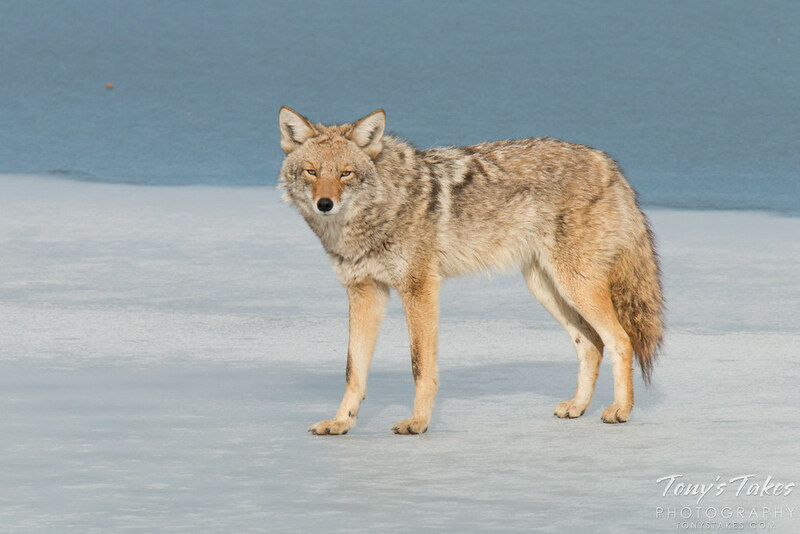 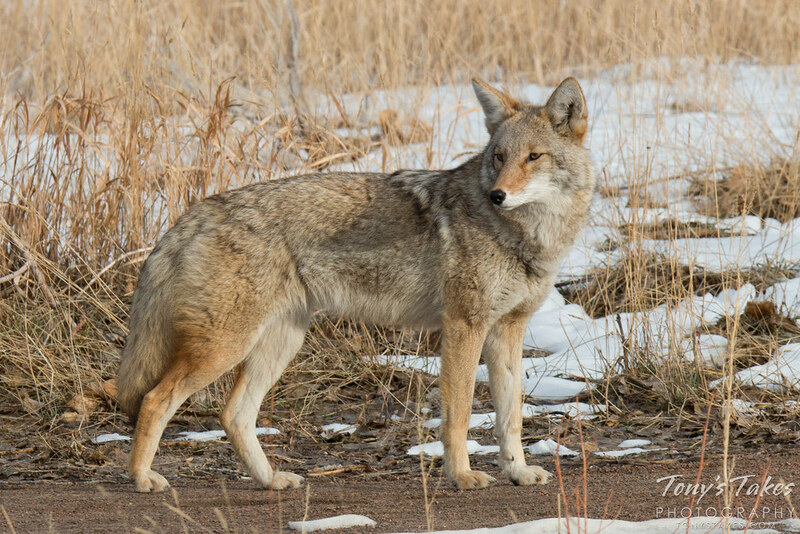 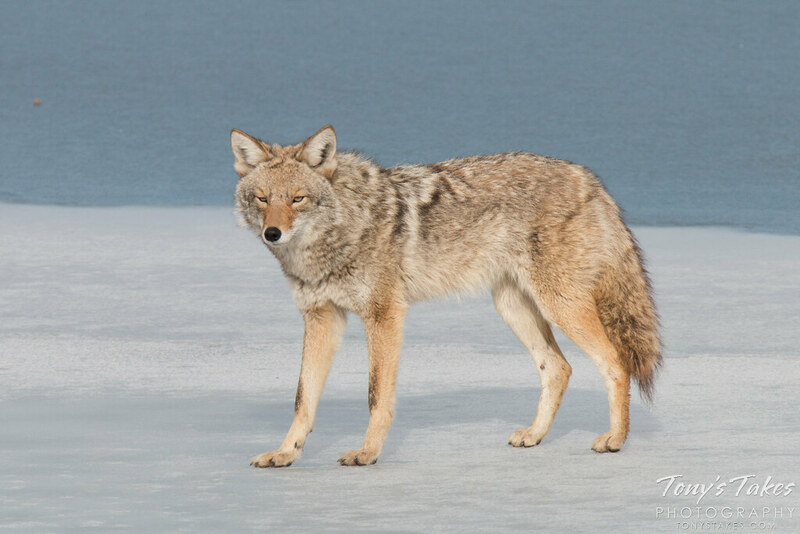 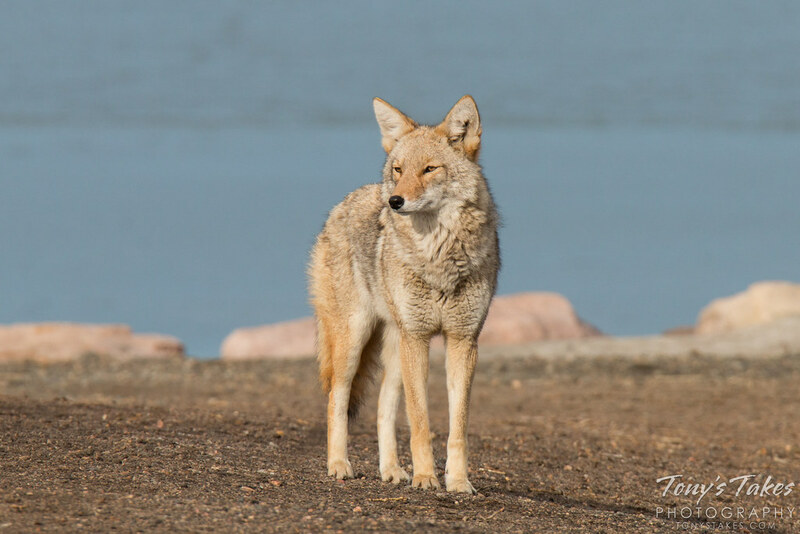 Coyotes are amazingly adaptable animals and have not been greatly impacted by human expansion. 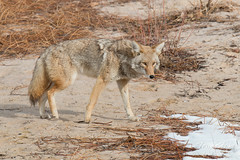 Here in the area I live, this has resulted in some human – coyote conflicts, mainly with the coyotes attacking domestic pets. They range across North America and some have even been seen into Central America and Panama. 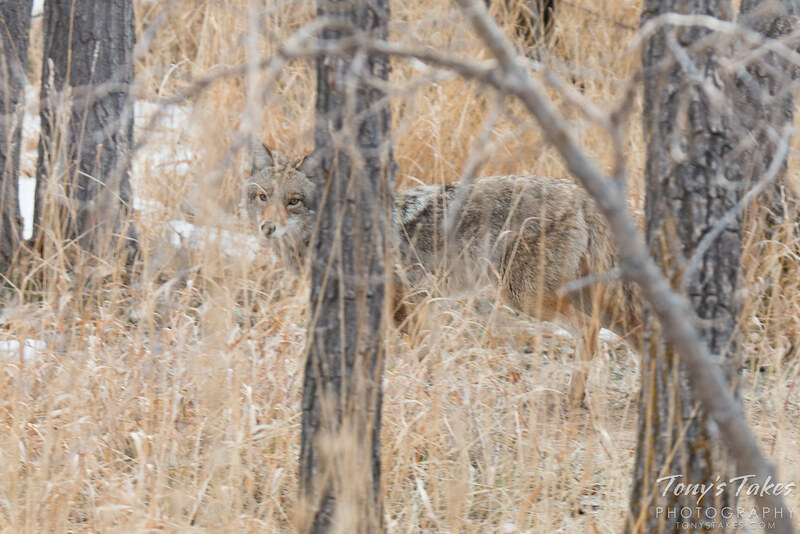 A friend clued me in on some coyote activity at a nearby open space area recently. 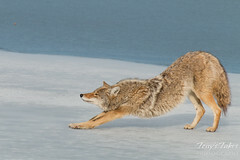 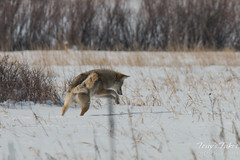 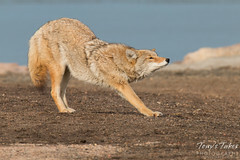 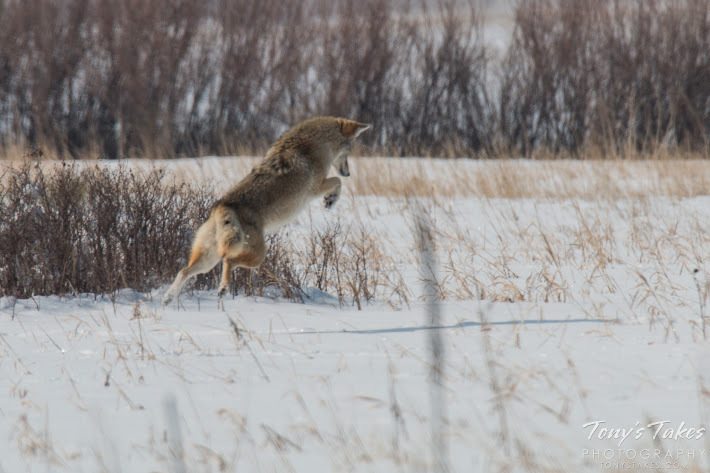 While coyotes are routinely seen there, this particular female had an interesting little routine. 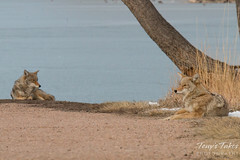 Apparently every morning she meets a particular couple with three dogs that walks along the South Platte River. 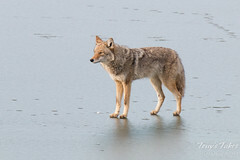 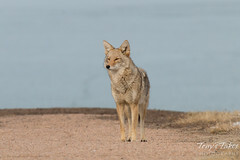 As they walk through the open space, the coyote follows along, barking the whole way. I arrived right at dawn and sure enough, I soon heard barking and as the walkers approached, I could see they were being followed by this very vocal hound. 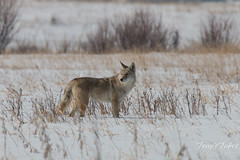 The coyote was completely non-aggressive and it really appeared she simply wanted the dogs to come play with her. 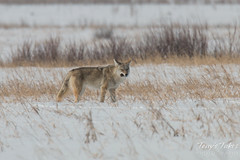 Clouds kept the early light dim and made for tough shooting but it was a lot of fun to watch. 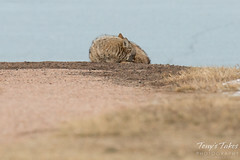 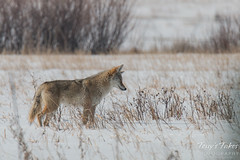 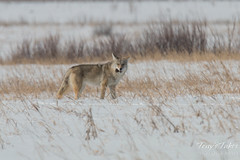 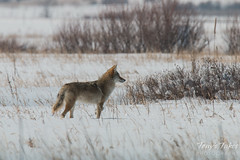 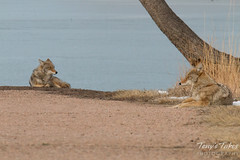 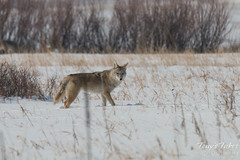 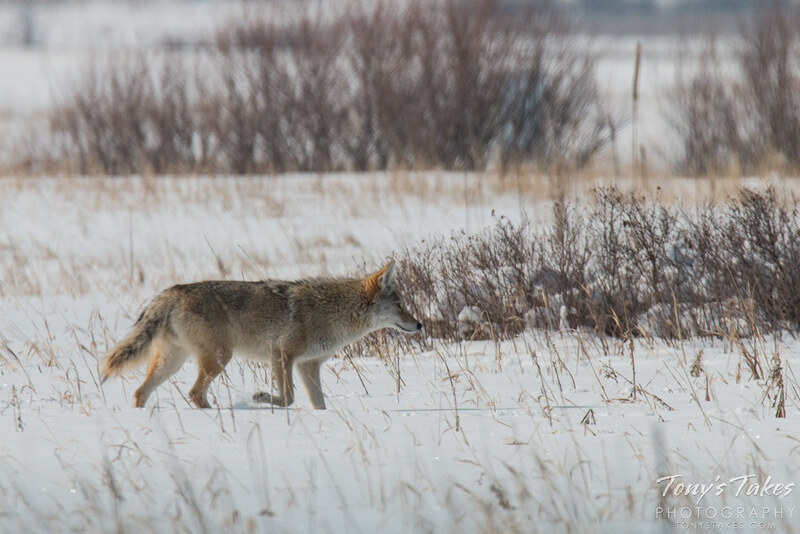 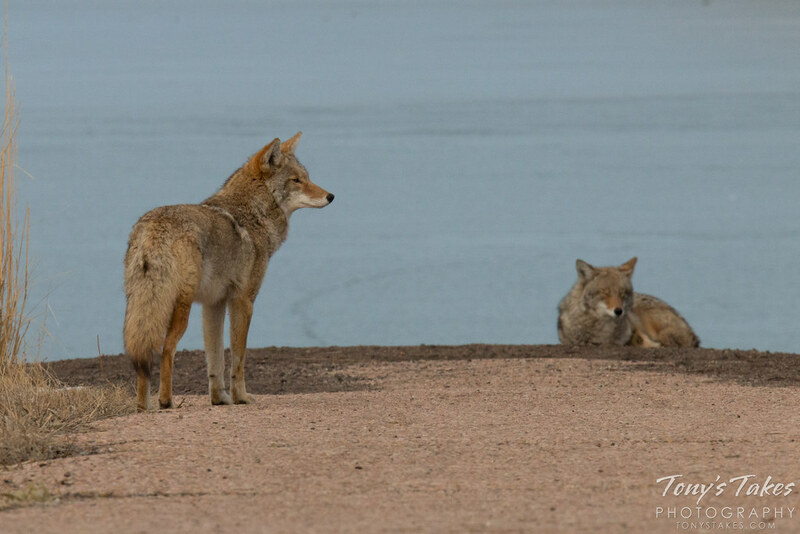 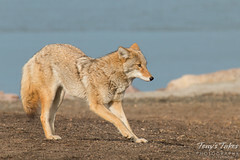 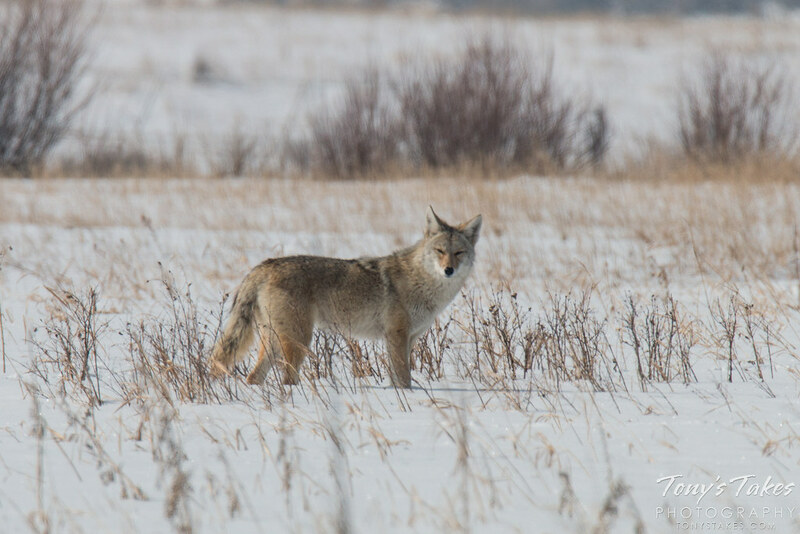 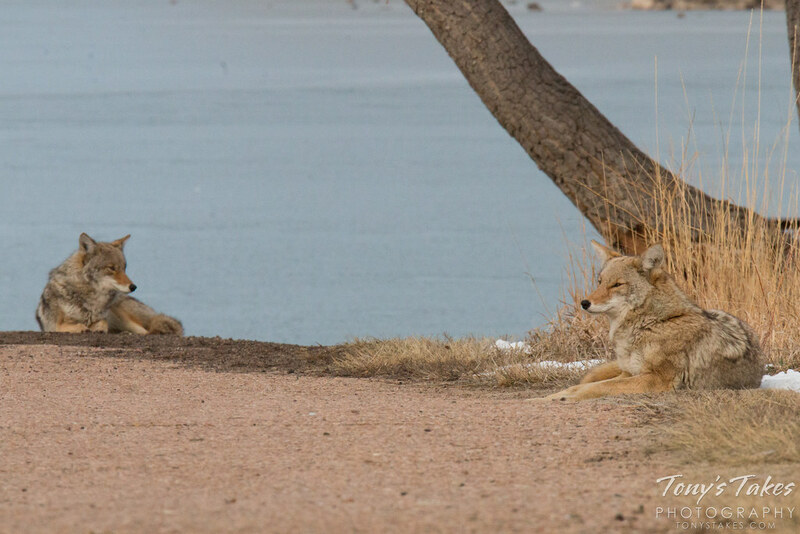 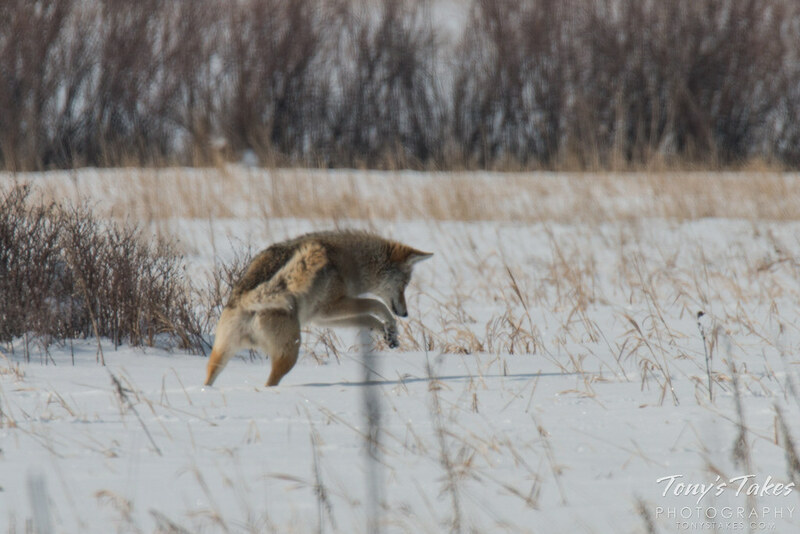 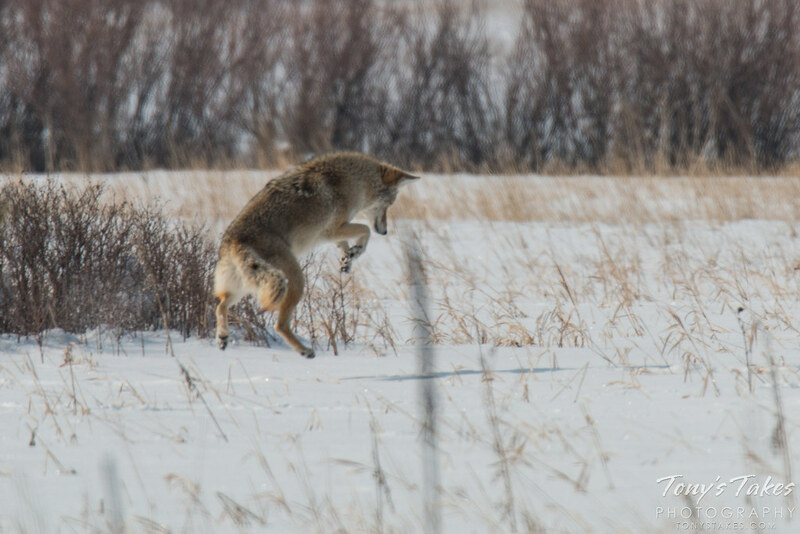 A shot of the two coyotes that I had the privilege of ‘meeting’ a couple of weeks ago. They were extraordinarily tolerant of me allowing me to spend 45 minutes or so observing them at relatively close range. I simply sat down on the ground and watched and they pretty much ignored me, even taking naps at one point. 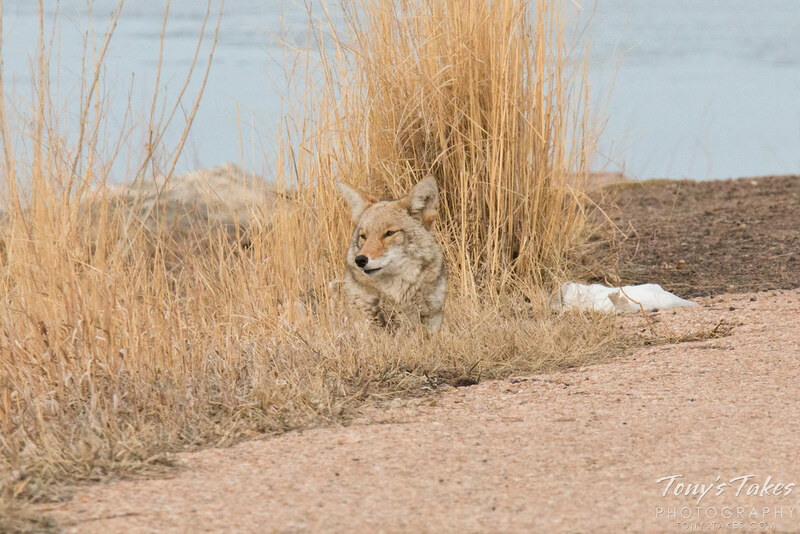 Taken at Cherry Creek State Park, Colorado. 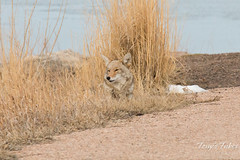 You can view the complete gallery of images of these two here. In photography, we call the golden hour the period just after sunrise or just before sunset. 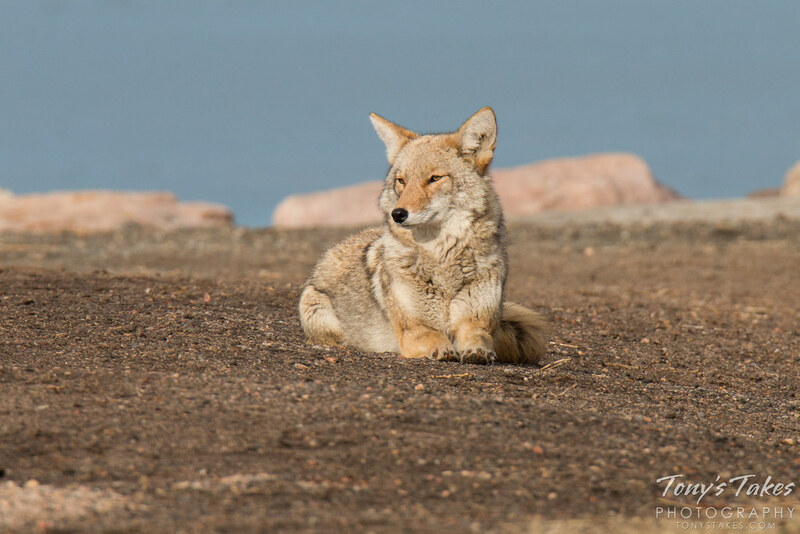 During that brief, fleeting time, the light is at its softest and warmest and is generally when the most pleasing pictures can be obtained. 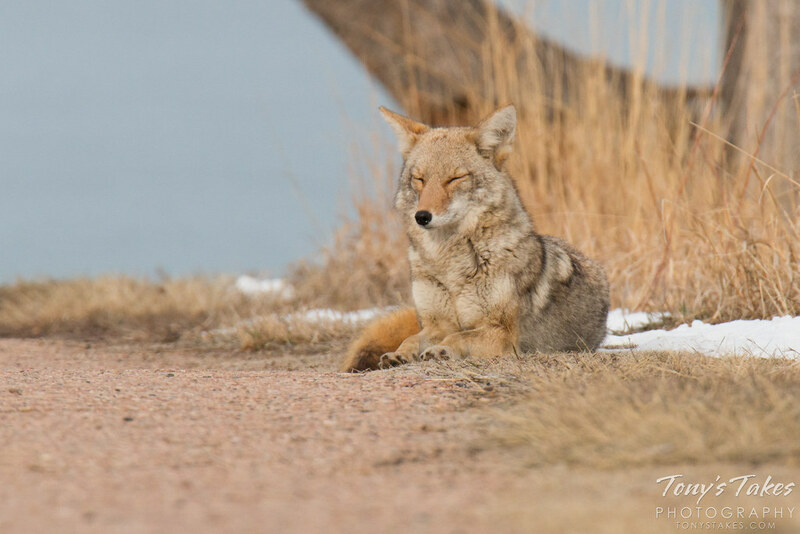 Certainly you can take pictures any time of day but it is during those two periods that many of your best images are likely to be obtained and is the reason most shutterbugs are early risers. 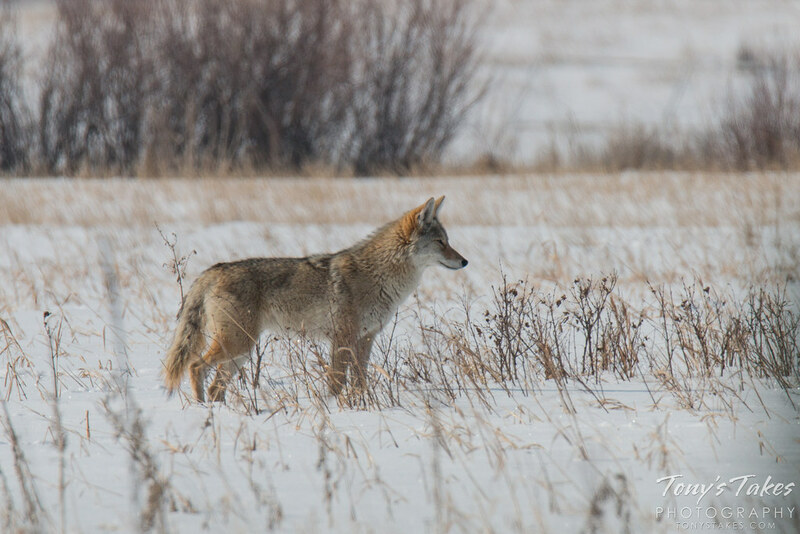 This image, taken this past Saturday, shows just how incredible the amber light can be and how it helps to create a great image. The coyote was out and about 15 minutes after sunrise, combing the field looking for breakfast. 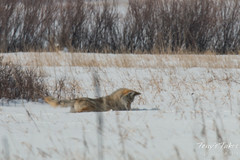 It stopped its hunt briefly to look around and I snapped this image. The golden light coupled with already amber grasses and the similarly colored coat of the watchful coyote create, IMHO, a very warm and pleasant picture. 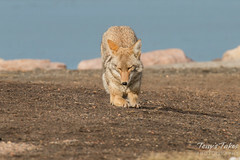 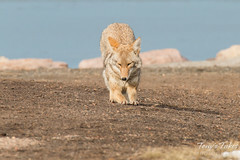 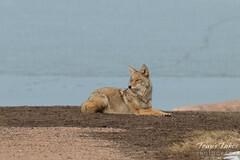 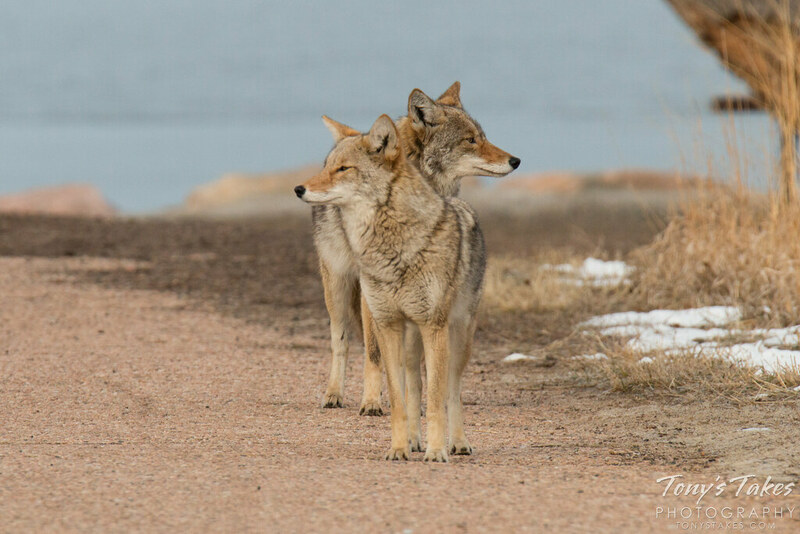 This past weekend I spent a great deal of time with an extraordinary pair of coyotes. 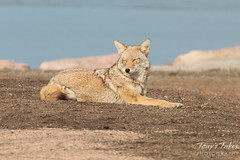 In this image you will see the male. 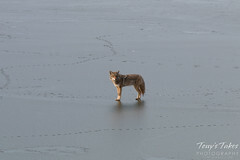 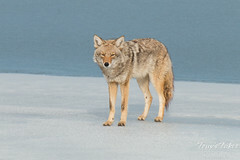 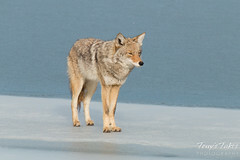 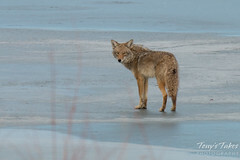 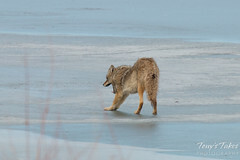 I initially spotted it on the ice of the frozen lake while the female was nearby on the shoreline. 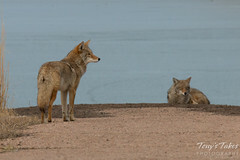 Both were surprisingly comfortable with my presence although the male was definitely more wary. 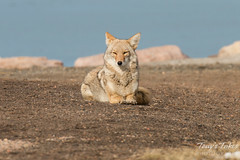 He however wasn’t too awfully concerned with me as you can see – he even curled up for a quick nap at one point. 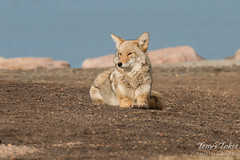 You can view more pictures of these gorgeous animals in the gallery here. 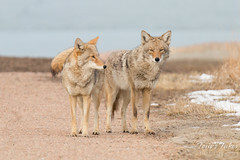 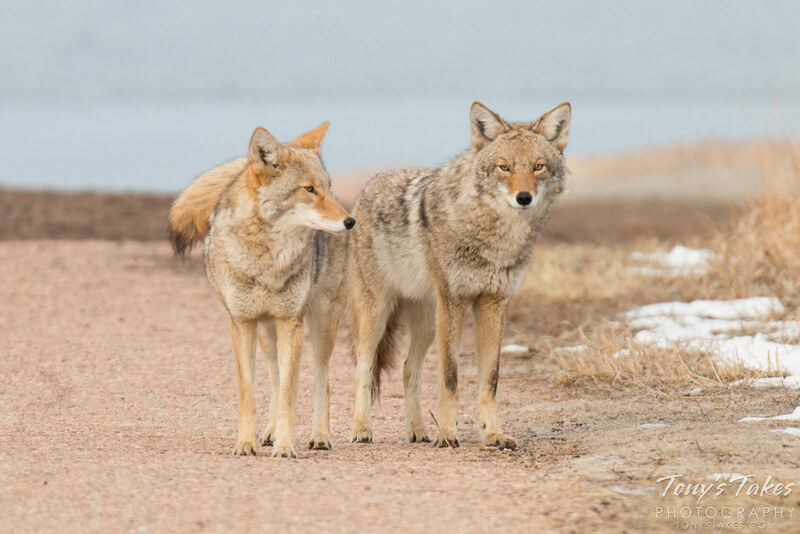 This morning I came across a pair of extraordinarily tolerant coyotes. The female in particular couldn’t of cared less about my presence, even laying down to take a nap while I watched. 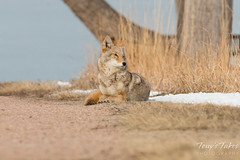 Taken at Cherry Creek State Park, Colorado, USA.? 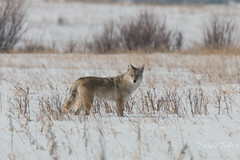 Scroll down to view the complete gallery of images. 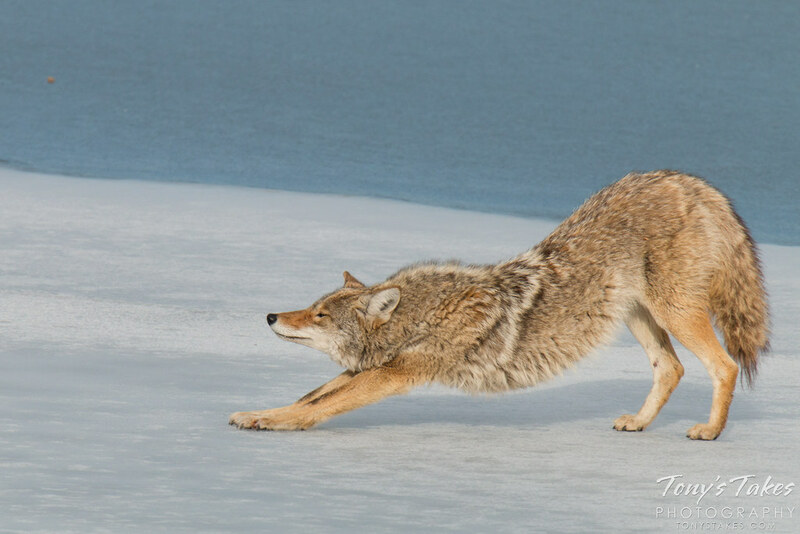 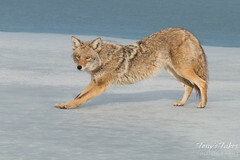 If you’ve never seen a coyote hunt for voles in the snow, it is a lot of fun and very interesting. 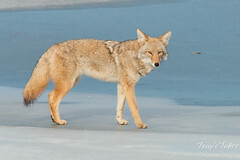 They walk very, very slowly and actually listen for movement under the snow. 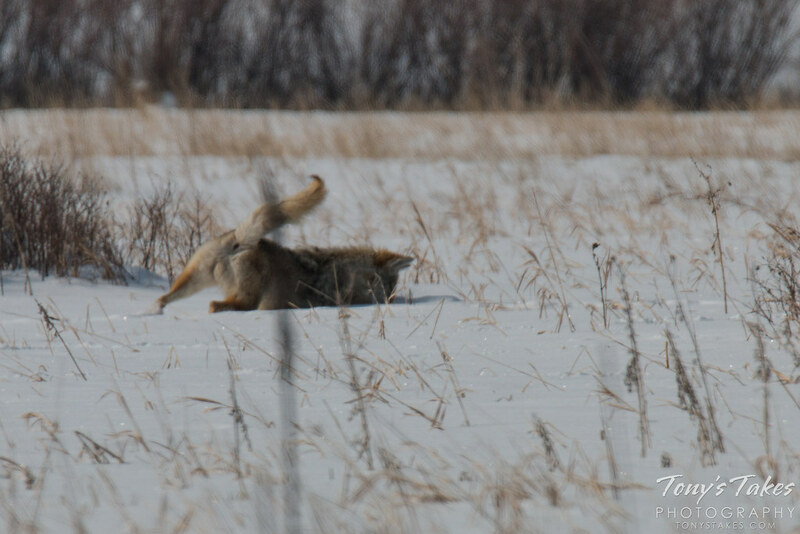 As they close in on the noise, they pounce into the air and down onto their prey. 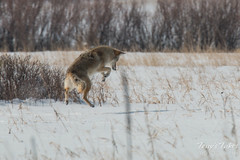 This series captures one such sequence. 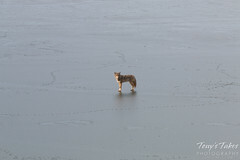 Sorry the quality isn’t that great – she was a good ways off. Taken at Cherry Creek State Park near Denver, Colorado. 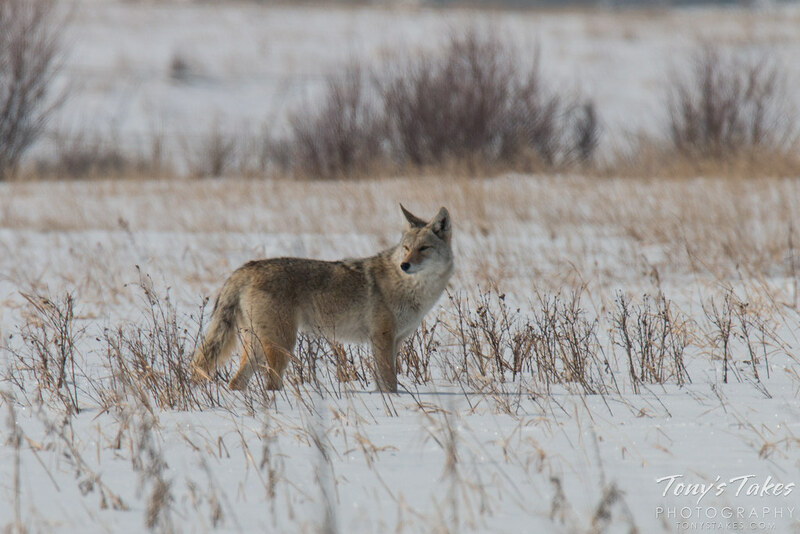 Scroll down below the main image for the complete gallery and sequence. 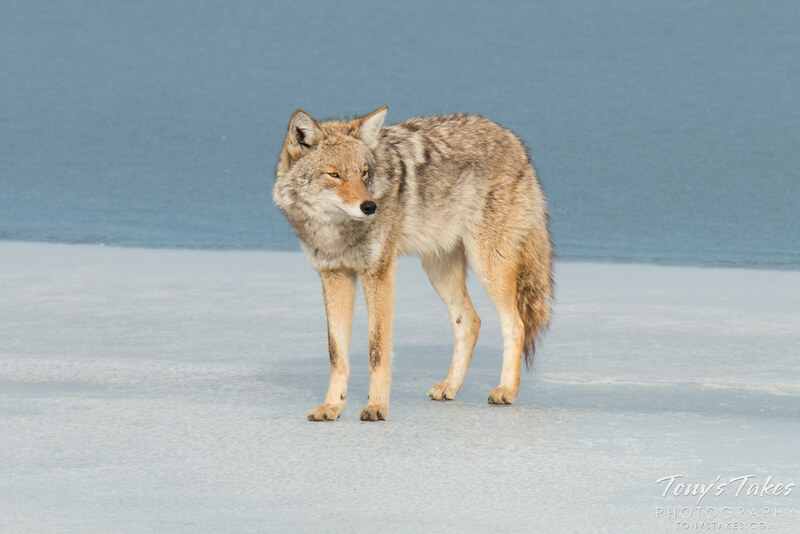 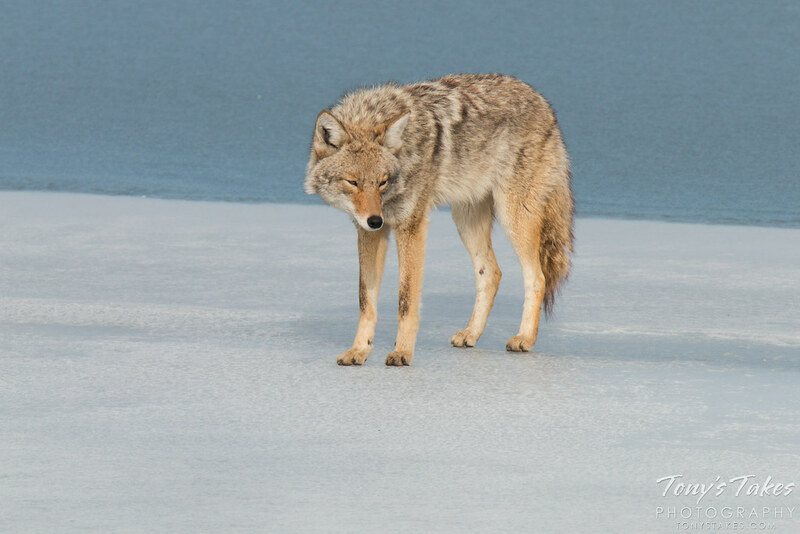 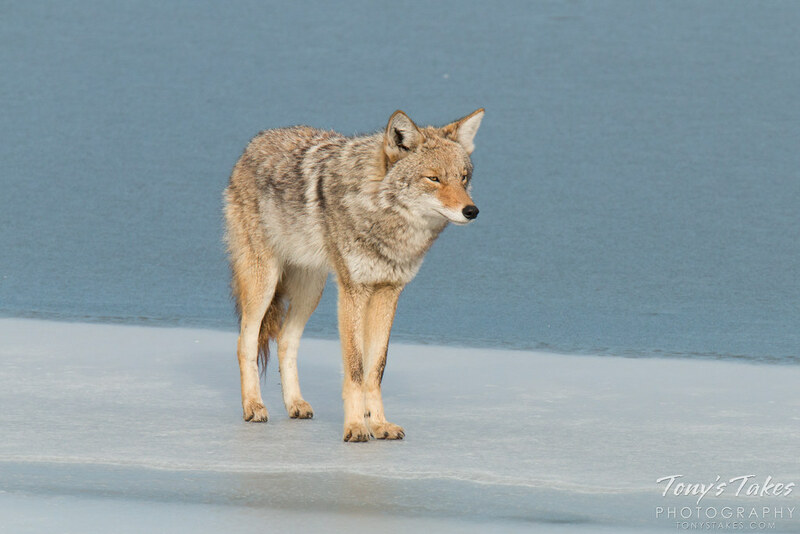 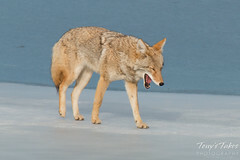 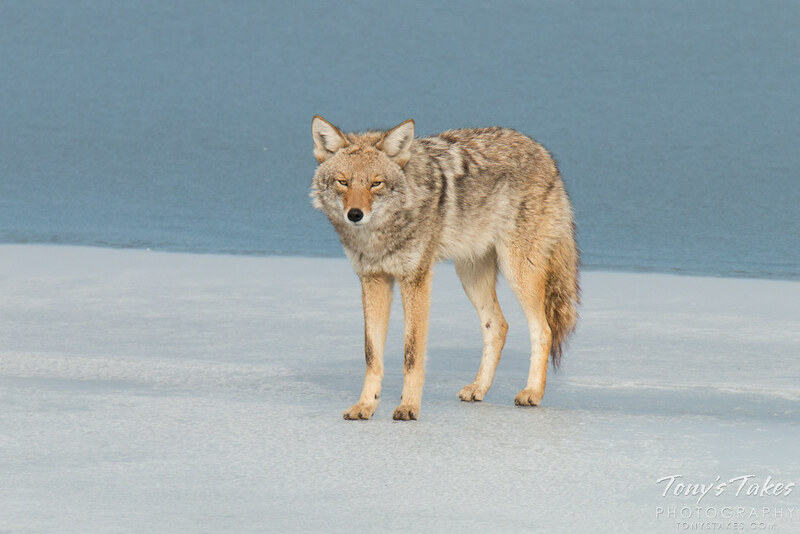 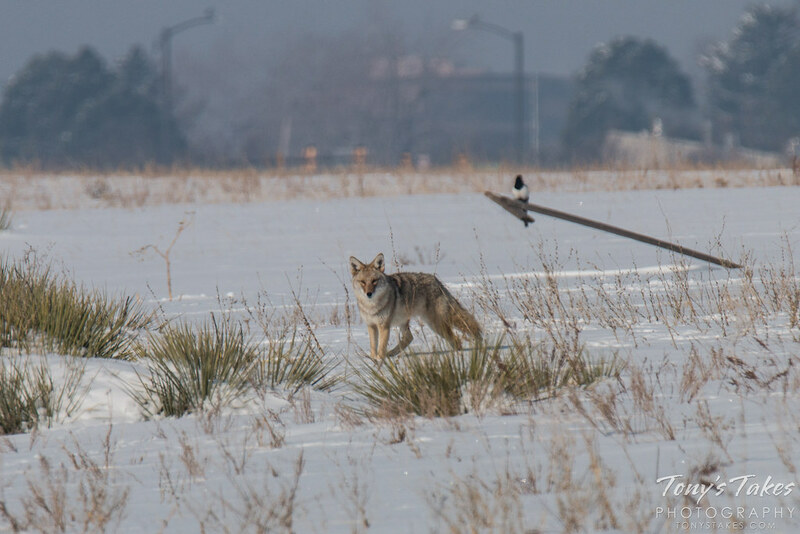 This coyote was out foraging this morning in the fresh snow at Cherry Creek State Park, Colorado. 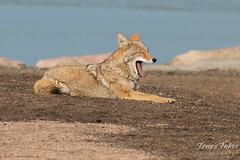 Tough day of shooting today with poor lighting and a bunch of rather uncooperative subjects. 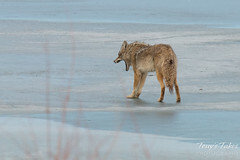 A bit of a Friday funny for you. 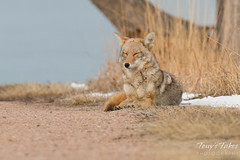 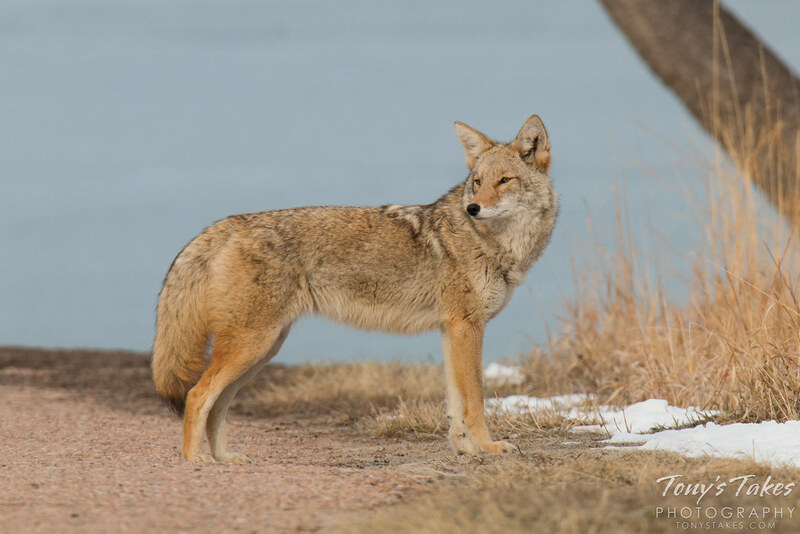 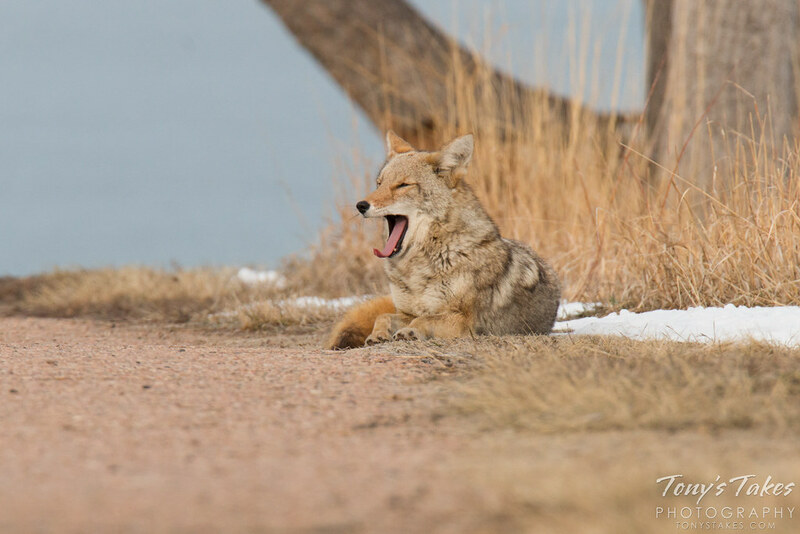 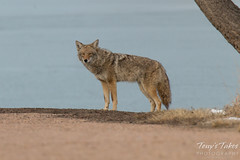 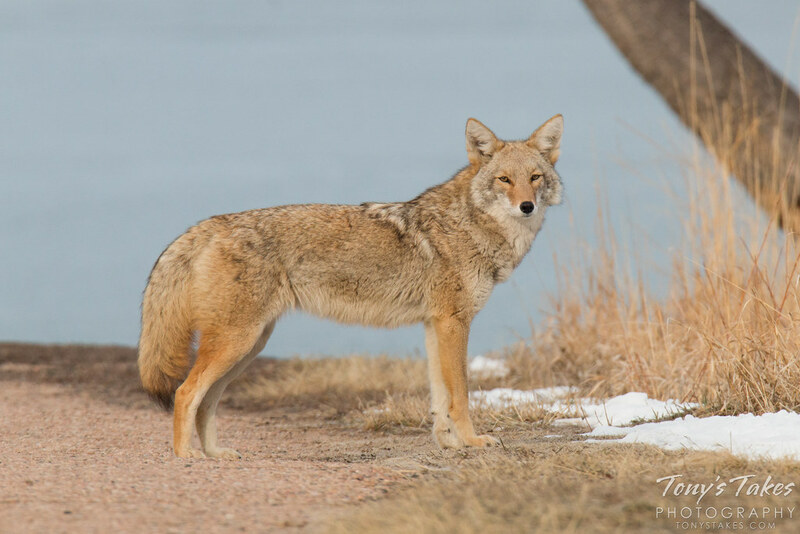 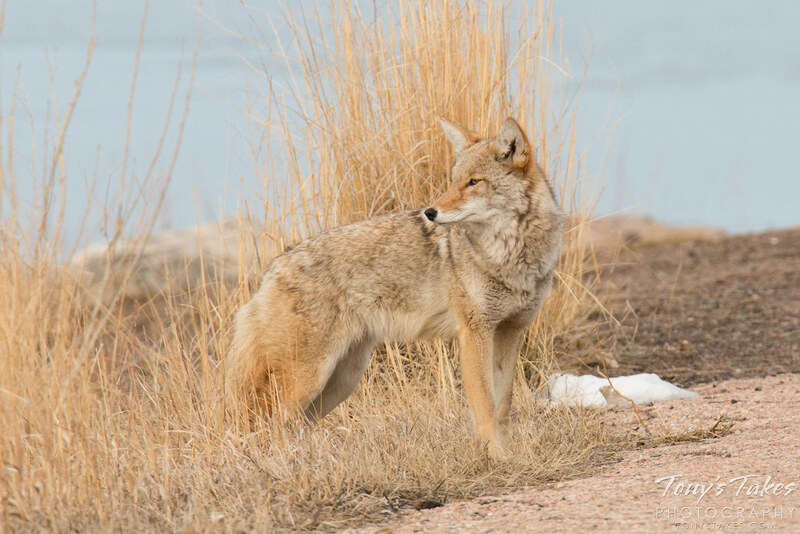 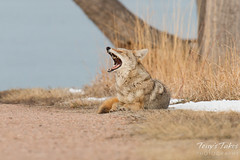 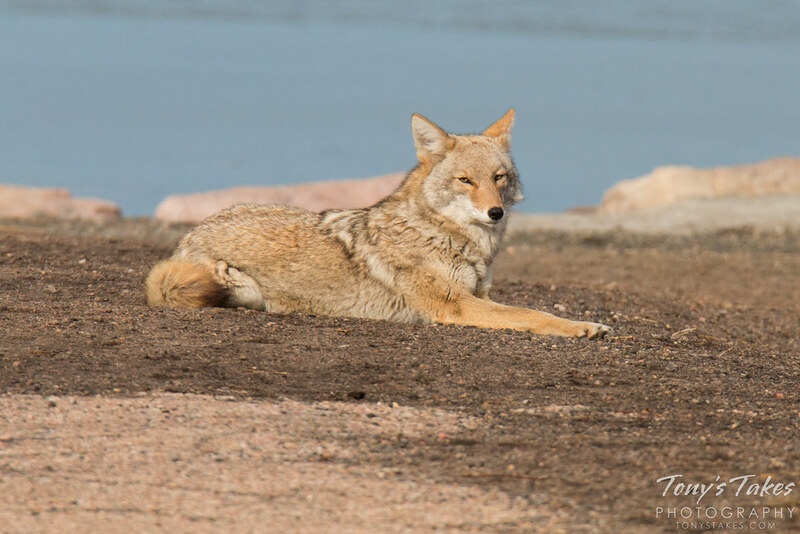 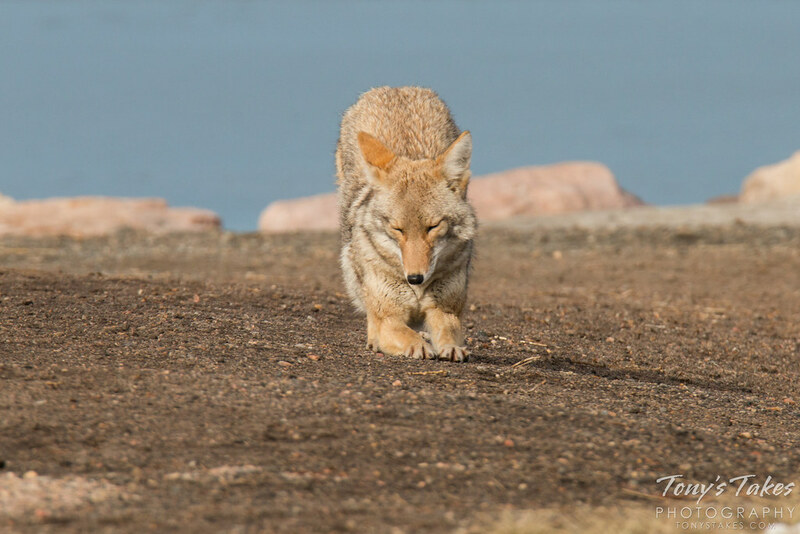 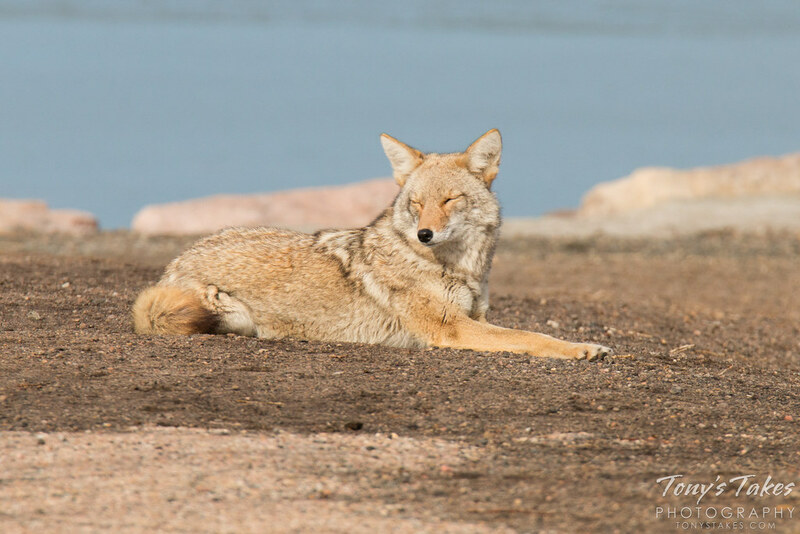 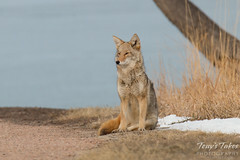 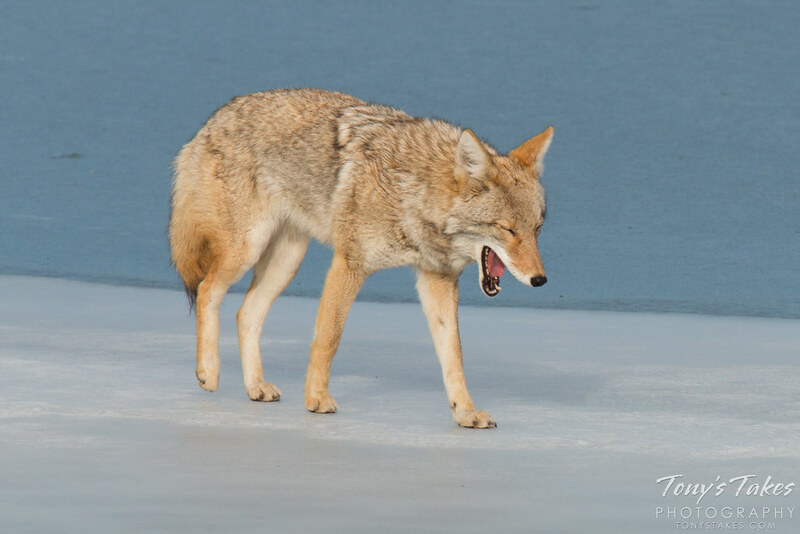 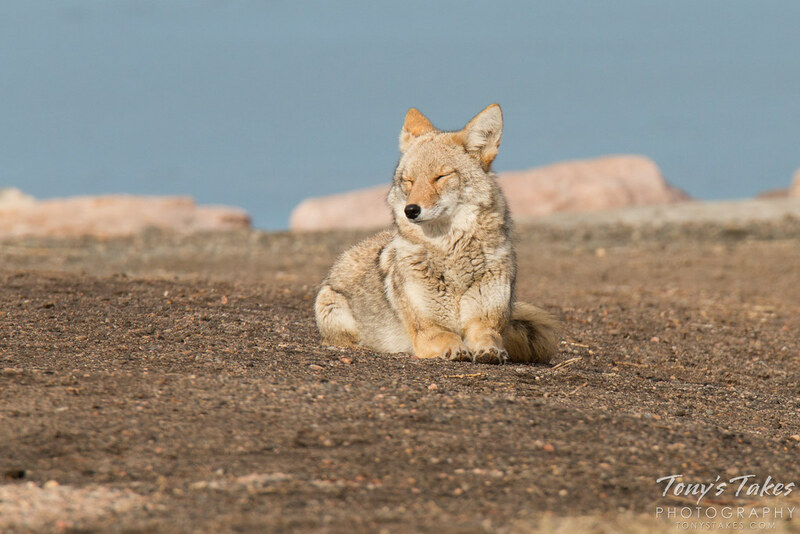 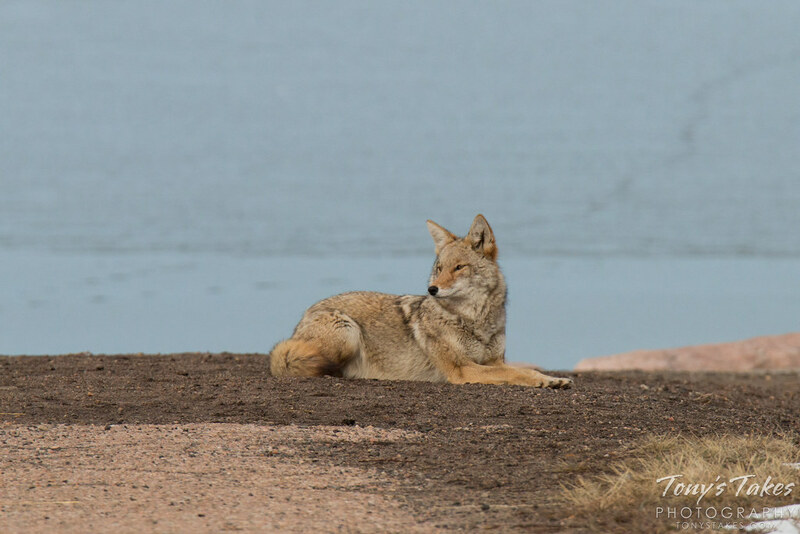 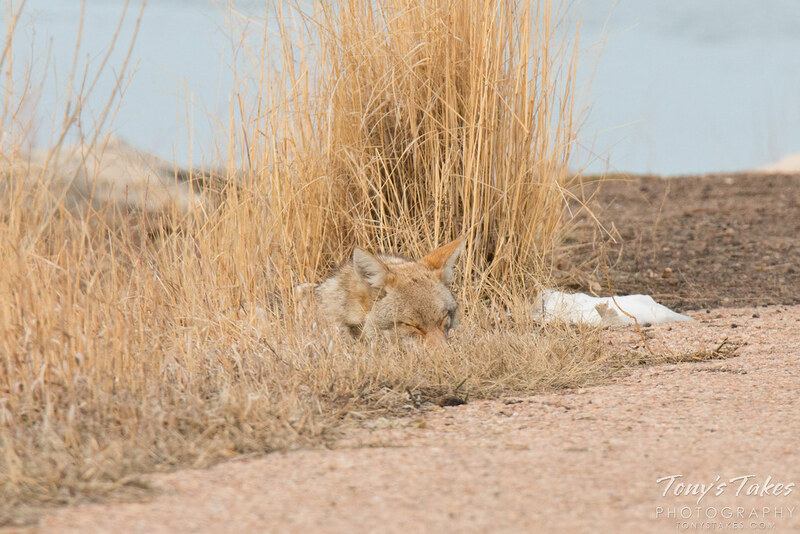 This coyote in Cherry Creek State Park, Colorado had to answer nature’s call recently. This good looking coyote was keeping close watch over the breakfast it had just caught. 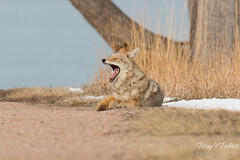 It must have had a bit of a long night of prowling as I snapped this pic mid-yawn.